The University of Notre Dame announced today that it has committed $80 million in internal financial resources in support of two phases of integrated research initiatives. The commitment of tens of millions of institutional dollars comes in the wake of the University receiving more than $90 million in external research funding in the past year. "This infusion of internal funds, combined with significant gains in external support, allows our scholars to significantly advance their contributions to the most pressing issues of our times," said Rev. John I. Jenkins, C.S.C., Notre Dame's president. "Excellence in research is a central goal at Notre Dame for many reasons, but most of all because it is through the scholarly and creative work of our faculty that the University is able to better serve society, which is our driving ambition." The first phase, funded up to $40 million, is for five initiatives, including two that reflect an exciting expansion of existing research strengths at Notre Dame in nanoelectronics and global health, as well as one for advanced diagnostics and therapeutics through the use of micro-instrumentation; another for an imaging core facility that brings together a broad array of imaging instruments, services and expert users; and one for a new multidisciplinary think tank to attract leading scholars who want to germinate research, scholarship and creative thought in the humanistic and faith-based environment that is Notre Dame's hallmark. The University has committed another $40 million for a second round of proposals in the next fiscal year, and a third round of similar funding has been proposed and is awaiting approval. The five initiatives to be supported by the initial phase of internal funding were identified through a grass-roots process that drew 72 faculty proposals. The five projects were identified by the Strategic Academic Planning Committee (SAPC) composed of a dozen faculty and administrators representing the University's various colleges. "Overall, the proposals funded are varied in their reach, methodology and emphases, but alike in their potential to address major challenges," Notre Dame's Provost Thomas G. Burish said. "We believe our current faculty and students, and those who are attracted to our ranks, will have the opportunity to make significant discovery that addresses the most important problems of the day," Robert Bernhard, vice president for research, said. Paul Bohn, Arthur J. Schmitt Professor of Chemical and Biomolecular Engineering, and a team of 22 researchers in the fields of electrical engineering, computer science and engineering, chemistry, biochemistry, biological sciences, and chemical and biomolecular engineering, will focus on developing innovative micro-sensing devices capable of supporting personalized health care and environmental monitoring. The effort will use nanotechnology spanning biology and chemistry to develop miniaturized monitoring capabilities for environmental and biomedical targets as well as critical distributed monitoring capabilities for developing countries. In healthcare, for example, the researchers envision clinical laboratories being replaced by small bedside monitoring devices which are dedicated to continuously monitoring a wide range of critical indicators. Such advances will enable personalized home health monitoring on a scale not currently imaginable. The same technologies also will usher in the revolution needed to develop and supply environmental and health monitoring to the developing world, such as dipstick monitors and simple kits to detect contamination in wells in Bangladesh. Frank Collins, Jeff Schorey and a team of 20 researchers from such areas as biological sciences, chemistry and biochemistry, computer science and engineering, the Interdisciplinary Center for the Study of Biocomplexity, and the Indiana University School of Medicine at South Bend, will seek to broaden the scope and nature of global health projects on campus. The effort will build on Notre Dames world-renowned Eck Family Center for Global Health and Infectious Diseases, which, for more than a half century, has studied infectious diseases that primarily afflict underdeveloped countries. The effort will strengthen the University's capabilities in insect biology and disease analysis to promote the development of new drugs and vaccines for malaria and other infectious diseases. Enhanced understanding of the genomes of mosquitoes and insect carriers of various infectious diseases will provide an opportunity to develop novel pesticides and disease treatments that will specifically target the disease or its carriers and have minimal effect on humans. The effort will strengthen research capabilities across campus in the area of genomics. As more pathogenic organisms are sequenced, the amount of genetic information will continue to expand and the use of comparative genomic analysis and other techniques should significantly improve our understanding of how these pathogens cause disease. Genomic information on the pathogens, as well as the insects that carry them, will be used by members of the center and others around the world to target the development of new drugs and vaccines. The dissection of genomic information will require expertise in various areas including computational sciences (bioinformatics). Resources also will be directed to the study of disease transmission in countries where malaria is endemic and to provide the intellectual and education framework for both undergraduate and graduate students to study infectious diseases. Wolfgang Porod and a team of 29 researchers from engineering, science, the Reilly Center for Science, Technology and Values, and the Gigot Center for Entrepreneurial Studies will build on Notre Dame's pioneering efforts in the field of nanoscience and further the momentum gained with the recent announcement that the University will be home of the Midwest Academy for Nanoelectronics and Architectures. With the miniaturization of the integrated circuit reaching physical and technological limits, NDnano will explore alternatives to standard silicon-based transistor technology, such as molecular and magnetic Quantum-Dot Cellular Automata, which was invented at Notre Dame. The effort also will seed research projects on energy extraction technologies, including light-harvesting solar devices and circuits, to develop new energy sources. In recognition of the fact that technological breakthroughs often arise from research into fundamental properties of materials, NDnano will study grapheme, a form of carbon with an extraordinary ability to conduct electrical current, and also will accelerate work on new nitride-based and magnetic semiconductors. Nanoelectronics also will have important applications in the biological and health sciences and the project will seed collaborations in these areas. The nanoscience researchers are teaming with the Reilly Center to examine the societal impact of the emerging research field. The researchers also will work with the Gigot Center to transfer intellectual property to entrepreneurial ventures. Mark Roche, O'Shaughnessy Dean of the College of Arts and Letters, and a proposal team of four scholars have designed a multidisciplinary think-tank that will attract leading scholars from around the world to collaborate with Notre Dame faculty and students. The Institute for Advanced Study will build on the University's distinctive Catholic identity and mission to help universities internationally to rethink the role of religion in modern history and modern knowledge and to explore integrative and ultimate questions as well as questions of value. The institute will enable 20 scholars and five graduate students per year to spend from two weeks to a full academic year in residence at the University. Applications will be welcome from individuals or teams of scholars. In its proposal, the group noted that the institute might, for example, offer an engineer working on the environment the opportunity to expand his or her specialized, technical work to include larger social and ethical questions. In return, an ethicist might find her reflections on applied ethics enriched by such conversations. Another example might be a comparative constitutional lawyer exploring the interface and gaps between law and morality. Bradley D. Smith, Emil T. Hofman Professor of Chemistry and Biochemistry, and a team of 16 science and engineering researchers will create the Notre Dame Integrated Imaging Facility, a state-of-the-art research resource that will consolidate the imaging capacity that is currently dispersed around the University's campus and augment it with powerful new imaging methods. 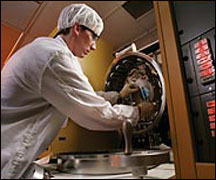 Since imaging is such an important and pervasive tool for research, the proposal is likely to benefit a significant portion of the researchers and post-doctoral, graduate and undergraduate students in 50 separate research groups from the Colleges of Science and Engineering, social sciences in the College of Arts and Letters, and the Notre Dame Radiation Laboratory. The facility will make available to the Notre Dame community an integrated suite of sophisticated microscopes and imaging stations that will enable the expert users to attack the most common complex research problems from nanoscopic to macroscopic scales. The facility also will feature a resident professional staff of technicians and research specialists to guide non-expert users and assist them in conducting experiments that were previously beyond their limits. The facility will help to create an interactive network of research groups joining forces to solve a wide range of important problems in high priority research fields such as biomedical science, nanoelectronics, systems biology, advanced diagnostics, functional materials and zero emission energy production. Originally published by William Gilroy at news.nd.edu on April 15, 2008.